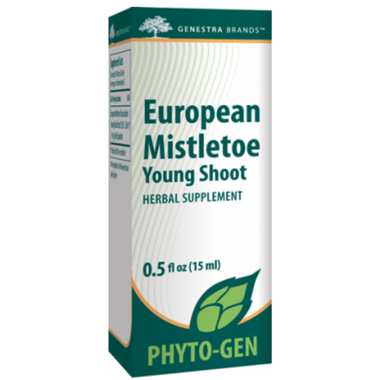 Genestra European Mistletoe Young Shoot is a herbal Phyto-Gen formula with mistletoe extract. Phytoembryotherapy is a branch of phytotherapy that specifically incorporates plant embryological tissues (buds, young shoots, etc.) containing plant meristem cells undifferentiated, fast dividing cells which contain the plant's genetic blueprint and material. 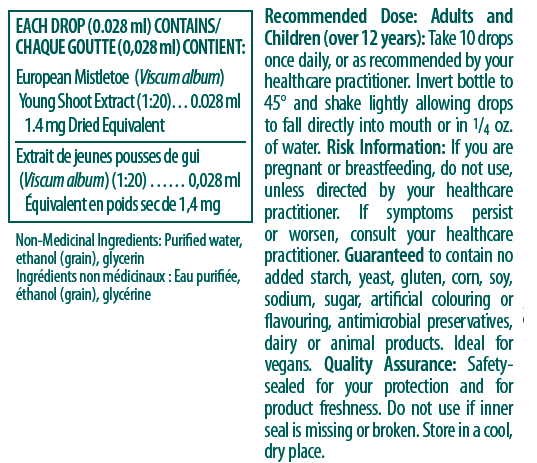 These embryonic tissues are rich in beneficial phyto-chemicals including: growth factors and plant hormones, enzymes, nucleic acids, oligoelements, and phytonutrients such as polyphenols and flavonoids. These embryological tissues are also utilized because many of the above mentioned components are lost in fully developed plants once chlorophyll is formed. These embryological tissues are also utilized because their energetic components are at their highest levels when they are harvested in the spring - the most active phase of the growth cycle.